PREVENT CARD FRAUD - Our wallets are layered with an advanced composite RFID blocking technology that's proven to block signals and shield against all unauthorised scans. Keeps your contactless cards secure and your data private. 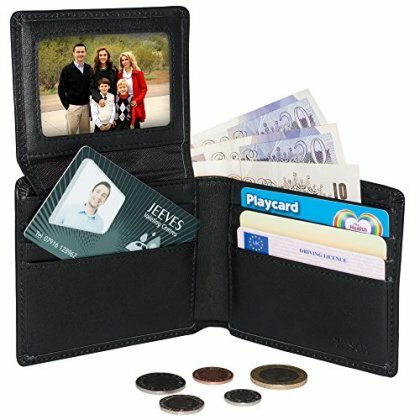 ELEGANT SLIM AND STYLISH - 6 card slots, 2 side pockets, 1 flip open ID window and 2 note compartments. The slim profile doesn't bulk up and slips comfortably in and out of your trouser pocket with ease. For convenience the flip open ID section allows quick access to your ID. GENUINE LEATHER - Made with premium grade napa leather it feels soft, smooth and luxurious. The classic design is well crafted and constructed with strong stitching to ensure your wallet will last for years. GIFT BOX - Includes an attractive gift box making it ideal as a present for any occasion. MONEY BACK GUARANTEE - Customer service hassle free. If for any reason you are not entirely satisfied with our products then please let us know. We will provide a full refund or, should you prefer, a free replacement.